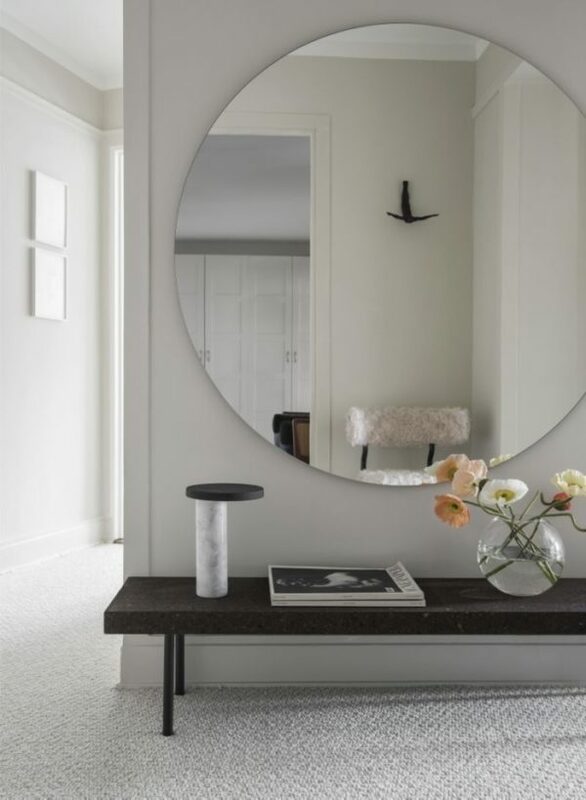 Entryways can often present a design conundrum. Tight spaces mixed with the need for organization can lead to spaces filled with a bevy of stuff – console tables, baskets, bins and coat racks or cheesy oversized entry organizations systems. It’s way too easy for an entry to become a dumping ground. That’s why I firmly believe that when it comes to an entry, less is more. I’m loving the look of a simple, classic entry bench. A bench can serve as an intentional piece of decor rather than a catchall, but still offer the function you need. I’m definitely stealing this idea. A bench offers the functionality an entry needs. You can sit and put on shoes, set down a bag – even drop keys or mail in a small tray. If needed, a simple hook or two to capture a hat or coat. Sure you can’t hide away clutter, but that’s kind of the point. An open bench helps you avoid the traps of closets or other closed storage – cramming them too full, holding onto too many things you no longer need or forgetting what you actually have. 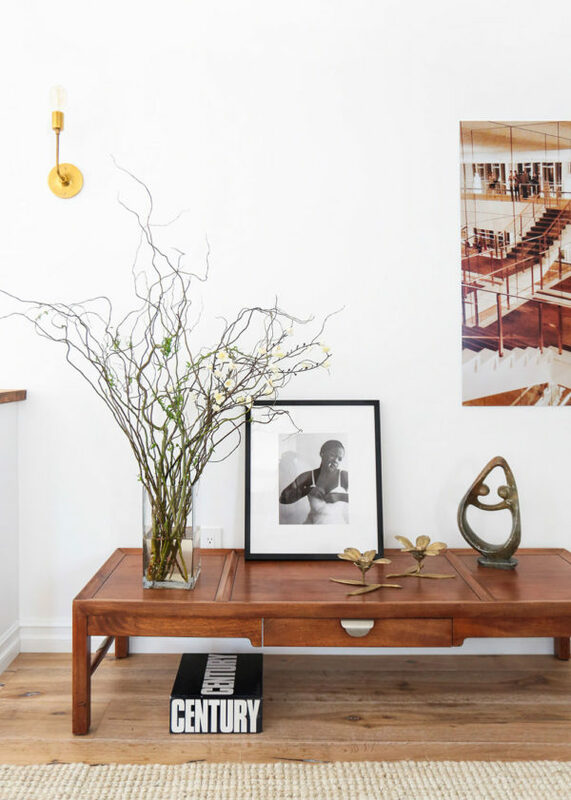 You can also use a bench as a place to display a few prized accents; maybe a favorite coffee table book, a sculpture or a fresh bouquet. It gives you something lovely to look at the moment you walk through the door and can set the tone for the entire house. And the bench itself can also be beautiful. There’s a long history of craftsmanship and design into this seemingly simple piece of furniture. After doing a little hunting, I found the perfect bench for my entry. Custom made in San Francisco by Moroccan Tazi Designs, I found a piece with classic construction that features a steel base and a thick mahogany slab in a natural finish. The look is understated and timeless. But it’s the brass feet that give it a little something special. I love having this piece in our house! 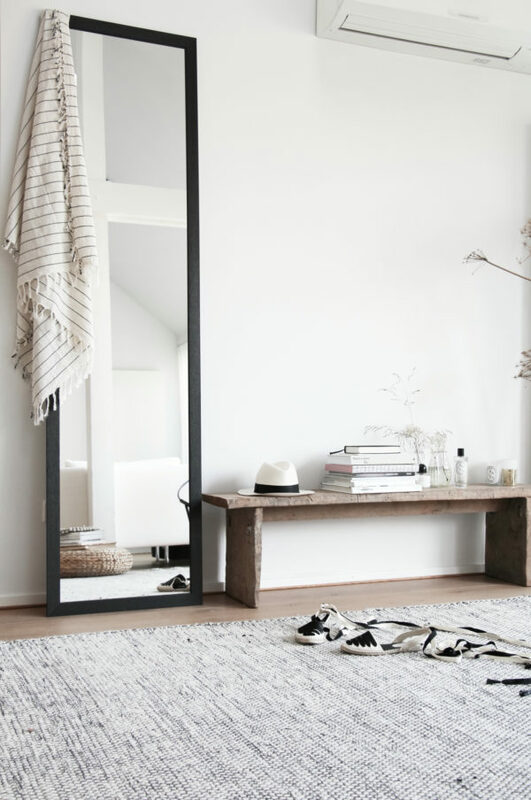 Here’s a little inspiration for how I’m planning to finish off my entryway look. For our entire Idea to Steal archive, CLICK HERE.